Football: Ryan Fieldhouse sparkles, but its ability to attract recruits is up for debate Northwestern football’s Ryan Fieldhouse is done, but will it boost recruiting? 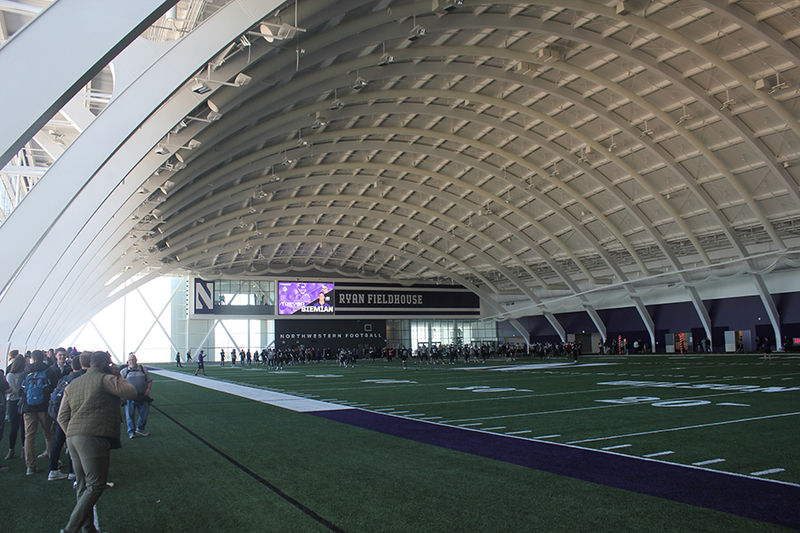 The Northwestern football team practices in the new Ryan Fieldhouse for the first time in April. The fieldhouse is part of the $270 million Walter Athletics Center, a facility that Northwestern hopes will help it keep up in the college football arms race. Khalid Jones, a three-star linebacker from South Carolina, signed his national letter of intent to play football for Northwestern in December. Jones, who enrolled at NU the next month, said he chose the school over programs like Wisconsin and Tennessee because of its academics and football staff. In addition, Northwestern’s new $270 million Ryan Fieldhouse and Walter Athletics Center played a part in his recruitment. This spring, Jones and his teammates became the first athletes to practice in Ryan Fieldhouse, a 96,135-square-foot full-size indoor football field. Representing a fifth of the Walter Athletics Center, which also contains locker rooms, lounges, gyms and other training amenities, the fieldhouse boasts 87-foot ceilings for punting and kicking practice, along with 45-foot glass windows overlooking Lake Michigan. Northwestern joins dozens of programs that have constructed eight and nine-figure facilities to keep up in the college football arms race and sign top-ranked recruits. Universities, with the help of donors, passionate alumni and season-ticket holders, have pumped millions into renovations and new buildings to attract four-and five-star recruits. Complexes vary in their amenities, ranging from Southern California’s $70 million facility for team offices and an underground practice field to Clemson’s $55 million “swanky playground for college students,” according to Business Insider — a complex exclusively for football players with features like a bowling alley and a mini-golf course. Clay Bollinger, the director of recruiting content for football at Tennessee, said top-tier facilities are “absolutely necessary” for a team to win games and are important for enticing recruits into committing to a school. But he added that he believes complexes are only one of the top factors that go into an athlete’s decision. Adam Rittenberg (Medill ‘03), a national college football reporter for ESPN, said Georgia recently built a $30 million indoor football facility to “feel on-par” with Alabama, which has regularly beat Georgia to top recruits and has won four national titles since 2011. Additionally, Rittenberg said UCLA, a program that for decades used its football tradition and its location in Los Angeles to lure recruits, “now must do more” to draw in top athletes. The Bruins, among the top 10 in 1997 and 1998, have not made a New Year’s Six bowl game since then. However, the university in recent years pumped $75 million into a new facility. Northwestern certainly fits the bill as a school lacking in tradition: It last appeared in the Rose Bowl in 1996 and hasn’t been in the national title picture since the 1930s, even though coach Pat Fitzgerald has brought moderate sustained success of late. The Wildcats now hope to lure athletes with its facilities, rather than records and bowl victories. Medill graduate student Darren Zaslau, who is researching the impact of athletic facilities on recruiting and team success, said he thinks the Wildcats’ state-of-the-art beachside complex will attract four-and five-star athletes. As a result, Northwestern’s game performance will gradually improve, enabling the school to recruit more talented athletes, he said. The facility may have actually already helped Northwestern’s future. This June, the Wildcats signed transfer quarterback Hunter Johnson from Clemson, formerly the nation’s top-ranked quarterback in the 2017 class. The program’s recruiting class for 2019 ranks 46th in the country — up from 59th in 2018, according to 247 Sports. But B. David Ridpath, a professor of sports administration at Ohio University, said he believes there is “no cause and effect of building facilities and bringing in highly ranked recruits,” especially for NU, a team that has struggled to recruit against Big Ten powerhouses. Only a small percentage of the national pool of college recruits can even be considered by NU, after all, due to the university’s strict academic standards. Still, Zaslau said the new complex will guide Northwestern, a top-25 team in end-of-season polls two of the last three years, on an upward path. With upgraded weight rooms and training areas, he said he believes Ryan Fieldhouse can help the team develop peak performance and attract recruits. The caption accompanying this story was updated at 6:16 p.m. to note the cost of the Walter Athletics Center. Drew Schott was a student in the Medill-Northwestern Journalism Institute this summer.